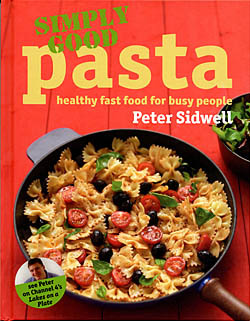 This is a no-nonsense cookbook from local Keswick-based chef, Peter Sidwell, which will help you to create great-tasting fresh pasta dishes. Nowadays, pasta is such a familiar cooking ingredient that it has almost become our own. Peter shows you how easy it is to prepare fantastic, quick pasta sauces to use when you are stuck for time. If you are late home from work, or rushed off your feet with dogs to walk and children to feed, don't reach for the takeaway menu! Simply Good Pasta will solve your dinner dilemmas. The simple recipes are great for busy people everywhere. From pesto, preserved peppers and slow-roasted tomatoes to your own ricotta and warm dressings for a lighter pasta dish, there are ideas for everyday eating as well as dishes to impress your guests.